Continuing with my review of Library Journal’s 2009 Notable Government Documents, today’s selection is The Approaching Storm: Conflict in Asia, 1945-1965. This first volume in a new Naval History and Heritage Command series is designed to present “well-illustrated, engagingly written, and authoritative booklets that detail the Navy’s major involvement” in the Vietnam War. The Approaching Storm is an auspicious beginning to this series. Its concise text places the Navy’s Southeast Asian operational activities in the post-World War II decade into the context of American and international politics. It’s instructive to follow internal political developments in South Vietnam, particularly during the Ngo Dinh Diem regime, and its effects on U.S.-Vietnamese naval collaboration. Despite the Navy’s best professional efforts in both riverine and blue water operations, “the greatest drawback to the development of the navy and other South Vietnamese armed forces was the involvement of their officers in plots, coups, and other political intrigues.” The book also presents a clear account of the Tonkin Gulf incident – a classic example of how the fog of war can obscure the facts for even the participants most closely involved in the action. Profusely illustrated by photographs and useful maps, The Approaching Storm also includes accounts of individuals involved in the events of the time. I was particularly interested in “Escape from Laos”, which tells the story of Navy Lieutenant Charles F. Klusmann, whose reconnaissance aircraft was shot down over central Laos in 1964. After almost three months of captivity, Lieutenant Klusmann and a number of others escaped from their Pathet Lao prison camp. After three days, Klusmann and one other escapee made it to friendly lines – one of the few American flyers to escape from captivity in Laos during the entire course of the war. 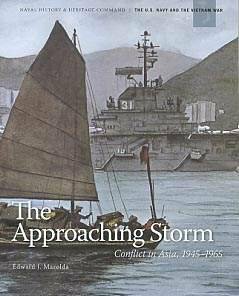 Like Navy Medicine in Vietnam, a previous volume in this series that I’ve blogged about, The Approaching Storm is an excellent brief account of one aspect of the Vietnam War – still perhaps the most controversial armed conflict in American history – whose story is neither well-known nor well-understood. You can get a copy here, browse through it here, or find it in a library here.